One of the best things about RV travel is the fact that you can bring your pets along. After all, who wouldn’t want to hit the open road with Rover and explore the great outdoors with their furry friend? That said, there are some things you’ll want to consider before setting out on your adventure with your animal. 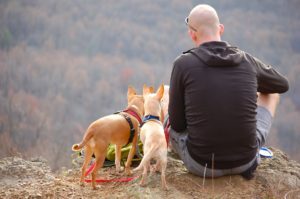 Read on to learn all you need to know about camping with pets. Some of the first things you’ll want to think about when considering traveling with pets involve their comfort and safety. You’ll also want to consider the safety of the people and animals around them. Shot Records — Most campgrounds require that pet owners provide shot records for any animals staying on their premises. 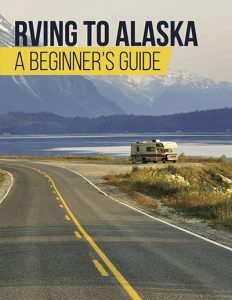 Always keep a copy in your RV so you’ll have this info on hand whenever needed. Motion Sickness — Some animals do suffer from motion sickness. Test the waters with your pet by taking a few car rides before your actual trip. If you find your animal does have a problem with car sickness, try these tablets to give them relief. Restricted Breeds — Be aware that many campgrounds have restrictions on the breeds of dogs that can stay with them. Pit bulls, for instance, are often turned away. Demeanor — Before adventuring with your pet, consider if he or she really has the personality for camping. A pet that is aggressive, noisy, or overly energetic may not do well in an RV park. Leaving the Rig — If you like to go out sightseeing, it is important to ensure your pet will be safe in your absence. An animal should never be left alone without A/C if it is hot outside, and since campground electricity is sometimes less than reliable, you will want a way to monitor the temperature of your rig while you’re gone. 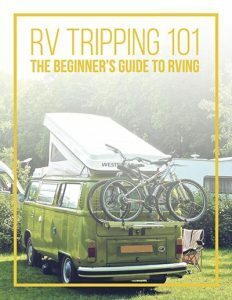 RV Accessories — There are a few RV accessories that can make traveling with your pet a bit easier. For instance, those with smaller dogs might find that a ramp to the door is a nice addition. Meanwhile, as we mentioned above, people who leave often might require a temperature monitor. Additional Needed Items — Some other items you will need include a good leash for walking your dog (or cat) and little bags for disposing of pet waste. If you plan on traveling with dogs or cats, you will want to make sure you get the best rig for the job. What we’ve found in most cases is that class A and class C motorhomes are the most pet-friendly RVs. This is because a motorhome gives your furry friend room to move around during travel and helps them feel more at home and comfortable on those long travel days. If you decide on a travel trailer, be aware that your pet should always travel in your tow vehicle and never in the trailer. Some pet owners find it best to get a pet carrier for travel days in order to keep their furry friend from wandering the vehicle throughout the trip. Cats—especially cats who live strictly indoors—can go most anywhere. However, planning dog-friendly vacations takes a bit more thought. When planning your travel days, be sure to schedule plenty of stops. 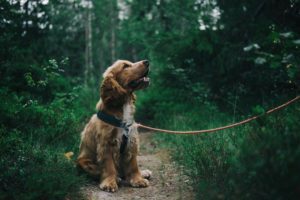 Dogs don’t like being cooped up any more than children do, and finding rest stops where they can run, play, and potty is crucial to ensuring everyone enjoys their vacation. Of course, your final destination must also be dog-friendly. Outdoor attractions that allow pups are the best option as they will give Fido a chance to get in on the vacation fun. However, choosing some attractions that require you to leave the dog in the RV is fine as long as you can keep the pup comfy while you’re gone and you won’t be gone too long. Believe it or not, not all campgrounds welcome pets. Therefore, you will want to call any campground you plan on staying in before booking. Be sure to ask if they allow all breeds—and if not, which breeds are restricted. Additionally, you’ll need to know what kind of medical records you’ll need to bring along. If you’re worried about your pup getting enough exercise during your stay, try to seek out campgrounds with dog parks. Not sure where to begin your search for a dog-friendly camping site? Try BringFido.com. This website is fantastic for finding lodging that is perfect for pups.